In TRD secondary to proliferative vitreoretinopathy (PVR) and penetrating trauma, contractile vitreoretinal, epiretinal, intraretinal (very rarely), or subretinal membranes pull the neurosensory retina away from the RPE. PVR can be considered to represent an inappropriate or uncontrolled wound healing response. Microscopic examinations of these membranes have revealed their cellular composition. RPE cells, glial cells, fibrocytes, macrophages, and collagen fibrils are important components of these membranes. RPE cells are the major players in these membranes. They gain access to the vitreous cavity during retinal break formation. It has been shown that the amount of RPE cells in the vitreous cavity correlates with the size of the retinal breaks. The larger the break, the larger the amount of RPE cells intravitreally. In addition, RPE cells also may be dispersed into the vitreous cavity by excessive cryotherapy, cryotherapy on bare RPE, and scleral indentation following cryotherapy. Once in the vitreous cavity, the RPE cells undergo morphological changes where they attain fibroblastlike activity, secreting growth factors that stimulate collagen and fibronectin production. 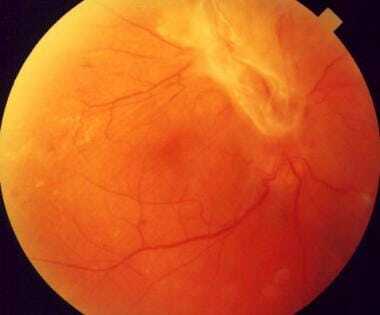 TRD may occur in a number of ocular pathologic conditions, such as proliferative diabetic retinopathy (PDR), sickling hemoglobinopathies, retinal venous obstructions, and retinopathy of prematurity (ROP), that are characterized by progressive retinal ischemia. Examples are shown in the images below. Patient with a central retinal vein occlusion complicated by neovascularization at the disc with subsequent tractional retinal detachment. This patient underwent a scleral buckle for a rhegmatogenous retinal detachment. 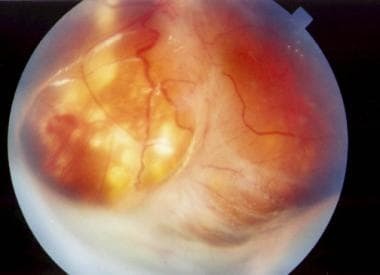 Now, the patient presents with proliferative vitreoretinopathy with a membrane tenting up and detaching the retina. 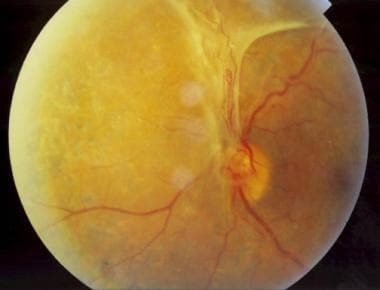 A patient with proliferative diabetic retinopathy complicated by a tractional retinal detachment over the supertemporal arcade. Progressive retinal ischemia leads to secretion of growth factors, especially vascular endothelial growth factor (VEGF). Neovascularization ensues, and the vitreous serves as a scaffold where strong vitreoretinal adhesions develop. With time, as the vitreous starts pulling away, a mechanical separation of the neurosensory retina from the underlying RPE occurs. PVR is responsible for most failures of retinal reattachment surgery. It occurs in about 7% of eyes after retinal reattachment surgery. In 1 year, approximately 1600 new cases of PVR are seen. Approximately 500 cases of blindness secondary to ROP are reported per year in the United States. Recent series have reported that the anatomical success rates of PVR are about 75-90%. However, the functional results are not that good since only about 40-50% of eyes attain 20/400 or better visual acuity. ROP complicated by TRD is the leading cause of childhood blindness. Diabetic retinopathy is the leading cause of blindness in the working age group. In the 1960s, prior to the advent of laser photocoagulation, up to 50% of patients with PDR were legally blind. With new techniques, currently only 5% of patients with PDR progress to legal blindness. TRD related to sickle cell disease occurs mainly in blacks. The incidence of TRD according to age depends on the cause. Visual prognosis depends on the underlying cause of TRD. Anatomical success rates for retinal reattachment surgery for PVR are anywhere from 75-90% of eyes. However, visual results are poor, since only about 40-50% obtain a visual acuity of 20/400 or better. The results after ROP surgery are very poor but better than the natural history (no light perception). Patients with diabetes must be aware that a fully dilated eye examination by a competent ophthalmologist should be performed at least once a year. Depending on the presence and degree of retinopathy, the patient may need to be seen on a more frequent basis. Patients should be educated about the importance of good glycemic, hypertensive, and lipemic control. Singer AJ, Clark RA. Cutaneous wound healing. N Engl J Med. 1999 Sep 2. 341(10):738-46. [Medline]. Choudhury P, Chen W, Hunt RC. Production of platelet-derived growth factor by interleukin-1 beta and transforming growth factor-beta-stimulated retinal pigment epithelial cells leads to contraction of collagen gels. Invest Ophthalmol Vis Sci. 1997 Apr. 38(5):824-33. [Medline]. Stocks SZ, Taylor SM, Shiels IA. Transforming growth factor-beta1 induces alpha-smooth muscle actin expression and fibronectin synthesis in cultured human retinal pigment epithelial cells. Clin Experiment Ophthalmol. 2001 Feb. 29(1):33-7. [Medline]. Nassar K, Lüke J, Lüke M, Kamal M, Abd El-Nabi E, Soliman M. The novel use of decorin in prevention of the development of proliferative vitreoretinopathy (PVR). Graefes Arch Clin Exp Ophthalmol. 2011 Nov. 249(11):1649-60. [Medline]. Kuiper EJ, Van Nieuwenhoven FA, de Smet MD, van Meurs JC, Tanck MW, Oliver N, et al. The angio-fibrotic switch of VEGF and CTGF in proliferative diabetic retinopathy. PLoS One. 2008 Jul 16. 3(7):e2675. [Medline]. [Full Text]. Arevalo JF, Maia M, Flynn HW Jr, et al. Tractional retinal detachment following intravitreal bevacizumab (Avastin) in patients with severe proliferative diabetic retinopathy. Br J Ophthalmol. 2008 Feb. 92(2):213-6. [Medline]. Arevalo JF, Sanchez JG, Saldarriaga L, Berrocal MH, Fromow-Guerra J, Morales-Canton V. Retinal detachment after bevacizumab. Ophthalmology. 2011 Nov. 118(11):2304.e3-7. [Medline]. Rice TA, Michels RG, Rice EF. Vitrectomy for diabetic traction retinal detachment involving the macula. Am J Ophthalmol. 1983 Jan. 95(1):22-33. [Medline]. Thompson JT, de Bustros S, Michels RG, Rice TA. Results and prognostic factors in vitrectomy for diabetic traction retinal detachment of the macula. Arch Ophthalmol. 1987 Apr. 105(4):497-502. [Medline]. Williams DF, Williams GA, Hartz A, Mieler WF, Abrams GW, Aaberg TM. Results of vitrectomy for diabetic traction retinal detachments using the en bloc excision technique. Ophthalmology. 1989 Jun. 96(6):752-8. [Medline]. Amarnani D, Machuca-Parra AI, Wong LL, Marko CK, Stefater JA, Stryjewski TP, et al. Effect of Methotrexate on an In Vitro Patient-Derived Model of Proliferative Vitreoretinopathy. Invest Ophthalmol Vis Sci. 2017 Aug 1. 58 (10):3940-3949. [Medline]. Sadaka A, Sisk RA, Osher JM, Toygar O, Duncan MK, Riemann CD. Intravitreal methotrexate infusion for proliferative vitreoretinopathy. Clin Ophthalmol. 2016. 10:1811-1817. [Medline]. Khan MA, Shahlaee A, Toussaint B, Hsu J, Sivalingam A, Dugel PU, et al. Outcomes of 27 Gauge Microincision Vitrectomy Surgery for Posterior Segment Disease. Am J Ophthalmol. 2016 Jan. 161:36-43.e2. [Medline]. Dikopf MS, Patel KH, Setlur VJ, Lim JI. Surgical outcomes of 25-gauge pars plana vitrectomy for diabetic tractional retinal detachment. Eye (Lond). 2015 Sep. 29 (9):1213-9. [Medline]. Berrocal MH. ALL-PROBE VITRECTOMY DISSECTION TECHNIQUES FOR DIABETIC TRACTIONAL RETINAL DETACHMENTS: Lift and Shave. Retina. 2018 Sep. 38 Suppl 1:S2-S4. [Medline]. Cruz-Iñigo YJ, Berrocal MH. Twenty-seven-gauge vitrectomy for combined tractional and rhegmatogenous retinal detachment involving the macula associated with proliferative diabetic retinopathy. Int J Retina Vitreous. 2017. 3:38. [Medline]. Khan MA, Samara WA, Hsu J, Garg S. SHORT-TERM OUTCOMES OF HYBRID 23-, 25-, AND 27-GAUGE VITRECTOMY FOR COMPLEX DIABETIC TRACTIONAL RETINAL DETACHMENT REPAIR. Retin Cases Brief Rep. 2017 Mar 29. [Medline]. Mikhail M, Ali-Ridha A, Chorfi S, Kapusta MA. Long-term outcomes of sutureless 25-G+ pars-plana vitrectomy for the management of diabetic tractional retinal detachment. Graefes Arch Clin Exp Ophthalmol. 2017 Feb. 255 (2):255-261. [Medline]. Rizzo S, Genovesi-Ebert F, Di Bartolo E, Vento A, Miniaci S, Williams G. Injection of intravitreal bevacizumab (Avastin) as a preoperative adjunct before vitrectomy surgery in the treatment of severe proliferative diabetic retinopathy (PDR). Graefes Arch Clin Exp Ophthalmol. 2008 Jun. 246(6):837-42. [Medline]. Arevalo JF, Maia M, Flynn HW Jr, Saravia M, Avery RL, Wu L, et al. Tractional retinal detachment following intravitreal bevacizumab (Avastin) in patients with severe proliferative diabetic retinopathy. Br J Ophthalmol. 2008 Feb. 92(2):213-6. [Medline]. Oshima Y, Shima C, Wakabayashi T, Kusaka S, Shiraga F, Ohji M. Microincision vitrectomy surgery and intravitreal bevacizumab as a surgical adjunct to treat diabetic traction retinal detachment. Ophthalmology. 2009 May. 116(5):927-38. [Medline]. da R Lucena D, Ribeiro JA, Costa RA, Barbosa JC, Scott IU, de Figueiredo-Pontes LL. Intraoperative bleeding during vitrectomy for diabetic tractional retinal detachment with versus without preoperative intravitreal bevacizumab (IBeTra study). Br J Ophthalmol. 2009 May. 93(5):688-91. [Medline]. Abrams GW, Williams GA. "En bloc" excision of diabetic membranes. Am J Ophthalmol. 1987 Mar 15. 103(3 Pt 1):302-8. [Medline]. Archives of Ophthalmology. Vitrectomy with silicone oil or sulfur hexafluoride gas in eyes with severe proliferative vitreoretinopathy: results of a randomized clinical trial. Silicone Study Report 1. Arch Ophthalmol. 1992 Jun. 110(6):770-9. [Medline]. Asaria RH, Kon CH, Bunce C, Charteris DG, Wong D, Khaw PT, et al. Adjuvant 5-fluorouracil and heparin prevents proliferative vitreoretinopathy: Results from a randomized, double-blind, controlled clinical trial. Ophthalmology. 2001 Jul. 108(7):1179-83. [Medline]. Asaria RH, Kon CH, Bunce C, Charteris DG, Wong D, Luthert PJ, et al. How to predict proliferative vitreoretinopathy: a prospective study. Ophthalmology. 2001 Jul. 108(7):1184-6. [Medline]. Asaria RH, Kon CH, Bunce C, Sethi CS, Limb GA, Khaw PT, et al. Silicone oil concentrates fibrogenic growth factors in the retro-oil fluid. Br J Ophthalmol. 2004 Nov. 88(11):1439-42. [Medline]. Azuma N, Ishikawa K, Hama Y, Hiraoka M, Suzuki Y, Nishina S. Early vitreous surgery for aggressive posterior retinopathy of prematurity. Am J Ophthalmol. 2006 Oct. 142(4):636-43. [Medline]. Blumenkranz M, Hernandez E, Ophir A, Norton EW. 5-fluorouracil: new applications in complicated retinal detachment for an established antimetabolite. Ophthalmology. 1984 Feb. 91(2):122-30. [Medline]. Blumenkranz MS, Hartzer MK, Hajek AS. Selection of therapeutic agents for intraocular proliferative disease. II. Differing antiproliferative activity of the fluoropyrimidines. Arch Ophthalmol. 1987 Mar. 105(3):396-9. [Medline]. Campochiaro PA, Glaser BM. Endothelial cells release a chemoattractant for retinal pigment epithelial cells in vitro. Arch Ophthalmol. 1985 Dec. 103(12):1876-80. [Medline]. Campochiaro PA, Glaser BM. Mechanisms involved in retinal pigment epithelial cell chemotaxis. Arch Ophthalmol. 1986 Feb. 104(2):277-80. [Medline]. Campochiaro PA, Jerdan JA, Glaser BM, Glaser BM. Serum contains chemoattractants for human retinal pigment epithelial cells. Arch Ophthalmol. 1984 Dec. 102(12):1830-3. [Medline]. Campochiaro PA, Kaden IH, Vidaurri-Leal J, Glaser BM. Cryotherapy enhances intravitreal dispersion of viable retinal pigment epithelial cells. Arch Ophthalmol. 1985 Mar. 103(3):434-6. [Medline]. Charteris DG, Aylward GW, Wong D, Groenewald C, Asaria RH, Bunce C. A randomized controlled trial of combined 5-fluorouracil and low-molecular-weight heparin in management of established proliferative vitreoretinopathy. Ophthalmology. 2004 Dec. 111(12):2240-5. [Medline]. Chen E, Park CH. Use of intravitreal bevacizumab as a preoperative adjunct for tractional retinal detachment repair in severe proliferative diabetic retinopathy. Retina. 2006 Jul-Aug. 26(6):699-700. [Medline]. Clarkson JG, Green WR, Massof D. A histopathologic review of 168 cases of preretinal membrane. Am J Ophthalmol. 1977 Jul. 84(1):1-17. [Medline]. Cusick M, Charles MK, Agrón E, Sangiovanni JP, Ferris FL, Charles S. Anatomical and visual results of vitreoretinal surgery for stage 5 retinopathy of prematurity. Retina. 2006 Sep. 26(7):729-35. [Medline]. de Juan E Jr, Sternberg P Jr, Michels RG. Timing of vitrectomy after penetrating ocular injuries. Ophthalmology. 1984 Sep. 91(9):1072-4. [Medline]. Glaser BM, Cardin A, Biscoe B. Proliferative vitreoretinopathy. The mechanism of development of vitreoretinal traction. Ophthalmology. 1987 Apr. 94(4):327-32. [Medline]. Greven C, Tasman W. Scleral buckling in stages 4B and 5 retinopathy of prematurity. Ophthalmology. 1990 Jun. 97(6):817-20. [Medline]. Hsu HT, Ryan SJ. Experimental retinal detachment in the rabbit. Penetrating ocular injury with retinal laceration. Retina. 1986 Winter-Spring. 6(1):66-9. [Medline]. Iverson DA, Katsura H, Hartzer MK, Blumenkranz MS. Inhibition of intraocular fibrin formation following infusion of low- molecular-weight heparin during vitrectomy. Arch Ophthalmol. 1991 Mar. 109(3):405-9. [Medline]. Khawly JA, Saloupis P, Hatchell DL, Machemer R. Daunorubicin treatment in a refined experimental model of proliferative vitreoretinopathy. Graefes Arch Clin Exp Ophthalmol. 1991. 229(5):464-7. [Medline]. Kirchhof B. Strategies to influence PVR development. Graefes Arch Clin Exp Ophthalmol. 2004 Aug. 242(8):699-703. [Medline]. Kirmani M, Ryan SJ. In vitro measurement of contractile force of transvitreal membranes formed after penetrating ocular injury. Arch Ophthalmol. 1985 Jan. 103(1):107-10. [Medline]. Lakhanpal RR, Fortun JA, Chan-Kai B, Holz ER. Lensectomy and vitrectomy with and without intravitreal triamcinolone acetonide for vascularly active stage 5 retinal detachments in retinopathy of prematurity. Retina. 2006 Sep. 26(7):736-40. [Medline]. Maguire AM, Trese MT. Lens-sparing vitreoretinal surgery in infants. Arch Ophthalmol. 1992 Feb. 110(2):284-6. [Medline]. Meredith TA, Kaplan HJ, Aaberg TM. Pars plana vitrectomy techniques for relief of epiretinal traction by membrane segmentation. Am J Ophthalmol. 1980 Mar. 89(3):408-13. [Medline]. Michels RG. Proliferative diabetic retinopathy: Pathophysiology of extraretinal complications and principles of vitreous surgery. Retina. 1981. 1:1-17. Miller B, Miller H, Patterson R, Ryan SJ. Retinal wound healing. Cellular activity at the vitreoretinal interface. Arch Ophthalmol. 1986 Feb. 104(2):281-5. [Medline]. Pastor JC, de la Rua ER, Martin F. Proliferative vitreoretinopathy: risk factors and pathobiology. Prog Retin Eye Res. 2002 Jan. 21(1):127-44. [Medline]. Quinn GE, Dobson V, Barr CC, Davis BR, Flynn JT, Palmer EA, et al. Visual acuity in infants after vitrectomy for severe retinopathy of prematurity. Ophthalmology. 1991 Jan. 98(1):5-13. [Medline]. Rachal WF, Burton TC. Changing concepts of failures after retinal detachment surgery. Arch Ophthalmol. 1979 Mar. 97(3):480-3. [Medline]. Schrey S, Krepler K, Wedrich A. Incidence of rhegmatogenous retinal detachment after vitrectomy in eyes of diabetic patients. Retina. 2006 Feb. 26(2):149-52. [Medline]. Singh AK, Michels RG, Glaser BM. Scleral indentation following cryotherapy and repeat cryotherapy enhance release of viable retinal pigment epithelial cells. Retina. 1986 Summer-Fall. 6(3):176-8. [Medline]. Stern WH, Lewis GP, Erickson PA, Guerin CJ, Anderson DH, Fisher SK, et al. Fluorouracil therapy for proliferative vitreoretinopathy after vitrectomy. Am J Ophthalmol. 1983 Jul. 96(1):33-42. [Medline]. Sun JK, Arroyo JG. Adjunctive therapies for proliferative vitreoretinopathy. Int Ophthalmol Clin. 2004. 44(3):1-10. [Medline]. Tano Y, Sugita G, Abrams G, Machemer R. Inhibition of intraocular proliferations with intravitreal corticosteroids. Am J Ophthalmol. 1980 Jan. 89(1):131-6. [Medline]. Trese MT. Visual results and prognostic factors for vision following surgery for stage V retinopathy of prematurity. Ophthalmology. 1986 May. 93(5):574-9. [Medline]. Ussmann JH, Lazarides E, Ryan SJ. Traction retinal detachment. A cell-mediated event. Arch Ophthalmol. 1981 May. 99(5):869-72. [Medline]. Vidaurri-Leal J, Hohman R, Glaser BM. Effect of vitreous on morphologic characteristics of retinal pigment epithelial cells. A new approach to the study of proliferative vitreoretinopathy. Arch Ophthalmol. 1984 Aug. 102(8):1220-3. [Medline]. Vidaurri-Leal JS, Glaser BM. Effect of fibrin on morphologic characteristics of retinal pigment epithelial cells. Arch Ophthalmol. 1984 Sep. 102(9):1376-9. [Medline]. Weiss JF, Belkin M. The effect of penicillamine on posttraumatic vitreous proliferation. Am J Ophthalmol. 1981 Nov. 92(5):625-7. [Medline]. Wickham L, Bunce C, Wong D, McGurn D, Charteris DG. Randomized controlled trial of combined 5-Fluorouracil and low-molecular-weight heparin in the management of unselected rhegmatogenous retinal detachments undergoing primary vitrectomy. Ophthalmology. 2007 Apr. 114(4):698-704. [Medline]. Wiedemann P, Lemmen K, Schmiedl R, Heimann K. Intraocular daunorubicin for the treatment and prophylaxis of traumatic proliferative vitreoretinopathy. Am J Ophthalmol. 1987 Jul 15. 104(1):10-4. [Medline]. Yeo JH, Sadeghi J, Campochiaro PA, Green WR, Glaser BM. Intravitreous fibronectin and platelet-derived growth factor. New model for traction retinal detachment. Arch Ophthalmol. 1986 Mar. 104(3):417-21. [Medline]. Yeoh J, Williams C, Allen P, Buttery R, Chiu D, Clark B, et al. Avastin as an adjunct to vitrectomy in the management of severe proliferative diabetic retinopathy: a prospective case series. Clin Experiment Ophthalmol. 2008 Jul. 36(5):449-54. [Medline].